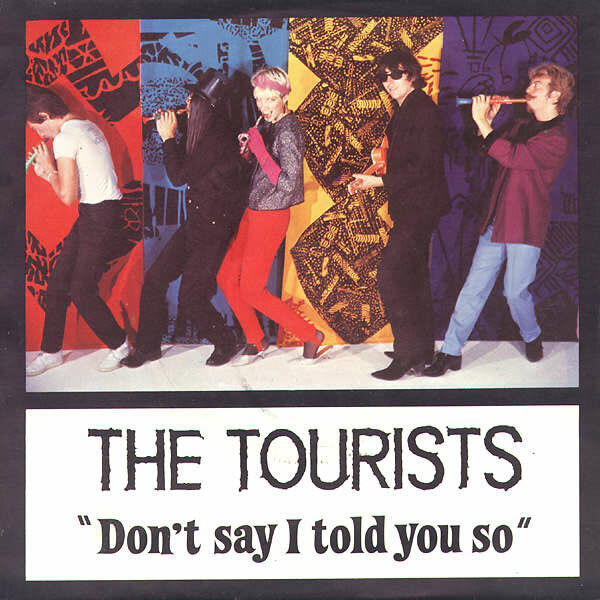 This single was the final single by the ill-starred New Wave combo The Tourists. I first became alerted to their manifold charms by a viewing of the video for the band’s cover of “I Only Want To Be With You” on the syndicated, pre-MTV show Rockworld in 1979. I immediately hopped on the “Reality Effect” album which is still to this day one of my favorite albums ever. I was more than primed when their next album was released in early 1980, but by the time the record was issued in the States, the band had already broken up, with Annie Lennox and Dave Stewart spinning off into Eurythmics the following year after a re-think of where they wanted to go [Germany, basically]. But none of this happened before a final single, the only one from their “Luminous Basement” album, was released. The A-side is a sturdy enough song, but next to grand slam material like “Walls + Foundations,” is comes up a little short in comparison. The most distinctive aspect of the song is the middle eight which features Latinesque percussion with heavy scratcher abuse before sharply EQ’ed Annie Lennox backing vocals repeating “hi-hi-hi…” [not unlike what Laurie Anderson offered on “O Superman”] and her screaming electric organ build the track to a somewhat strident peak. Still, my mind reels at the thought of “Walls + Foundations” denied a chance to crush the competition on the charts as it surely deserved to. The non-LP B-side here was “Strange Sky” a slow-burning look at nuclear annihilation [it always felt like “ten minutes to midnight” in the Reagan years]. The song is far too much of a downer to have even been added to their final album, so it belongs here just fine. Strangely enough, the song cops the two-chord hook of Aerosmith’s “Dream On” middle eight! This just occurred to me after over 20 years of owning this track! I didn’t buy this when it was released. In all candor, I never saw it in the tiny import 7″ bin [note lack of plural] at my local emporiums of the time. It remained until the Pandora’s Box of mail order via catalogs/Goldmine that I finally made the moves on collecting the complete output of long time favorites like The Tourists. I probably bought this some time between 1988 and 1990, back when the records cost more than the postage. Sigh. This entry was posted in Core Collection, Record Review and tagged Annie Lennox, Dave Stewart, Peet Coombs, The Tourists. Bookmark the permalink. It’s funny how incredibly durable the music of the Tourists is compared to how fragile their career was. New Wave started out as a reinvention of 50s rock, but the Tourists were among the first to bring an early-60s feel to it which I find incredibly listenable. I hope someday someone does a real documentary on the Tourists while most of the principles are still alive. I love this band and am very determined to someday have their entire recorded output. Chasinvictoria – 50s? Funny. I always thought that New Wave was 60s pop with 70s technology. I always felt that New Wave went from Rockers to Mods in its development. I admit that early New Wave acts like Elvis Costello, Joe Jackson and the B-52s among others — clearly influenced by the styles of artists and movements in the 50s — may be influencing my opinion.